About this object Serving 30 years in the House of Representatives, Carl Albert of Okalahoma earned the nickname "Little Giant" as a high school senior. The endearment stuck with him through his rise to Speaker of the House in 1971. On this date, the 26th Amendment to the Constitution was ratified. In the turmoil surrounding the unpopular Vietnam War, lowering the national voting age became a controversial topic. Responding to arguments that those old enough to be drafted for military service, should be able to exercise the right to vote, Congress lowered the voting age as part of the Voting Rights Act of 1970. The Supreme Court upheld the legislation in a 5 to 4 vote in applying the lowered voting age to federal elections only. A constitutional amendment was required to uniformly reduce the age to 18. 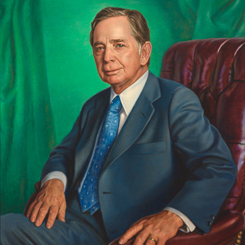 Endorsed by Speaker Carl Albert of Oklahoma, the amendment passed the House by a vote of 401 to 19, on March 23, 1971. The state legislatures in Ohio and North Carolina were the last to approve the amendment before official ratification took effect on July 1, 1971. With the 1972 elections looming, the 26th Amendment was ratified in record time. The Richard M. Nixon administration certified it four days later on July 5. The U.S. House of Representatives has been a popularly-elected body with its membership reconstituted every two years throughout its history.